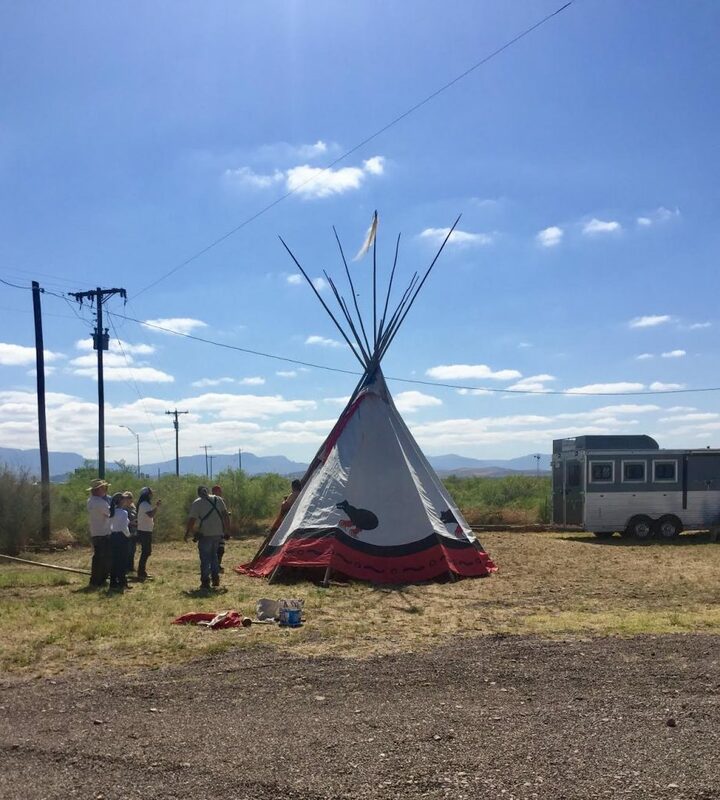 Today in Toyahvale near Balmorhea, Texas at the inaugural Earth Day celebration I demonstrated solar oven cooking by making smores in my solar oven, I learned how to put up a teepee and I learned just how far Apache Corp. harassment and intimidation will extend to anyone who opposes fracking in Balmorhea. I met Chancellor Alex Glover-Herzog when Molly Dunton, Earthworks’ Community Empowerment Project coordinator, and I were in Balmorhea in March. Chance has a drone and was showing us some pictures he took that day. I don’t really know him but he seems intense, which is certainly not a trait with which I can find fault. Friday, the Reeves County Sheriff came to Camp Toyahvale and arrested Chance for operating an unmanned aircraft over critical infrastructure (or something like that). How far will Apache Corp. go? I will try to piece together what happened to lead up to this arrest and the difficulties in getting him released on bail. It is complicated so please bear with me and, If I get something wrong or a little off, let me know. On April 20th, Chance did something, according to hearsay, he shouldn’t have done: flew his drone over private property. A Reeves County Sheriff’s Deputy also did something he shouldn’t have done: while employed by Apache as a private security guard at Apache’s Weismiess lease, he pretended to be an on duty Sheriff’s Deputy and, while wearing his badge and gun and driving a Reeves County Sheriff’s vehicle, he detained Chance and George until the real, on duty Sheriff’s Deputies could get to the site. Chance and George were given warnings with the charge of criminal trespass, which is an incorrect charge according to Texas Statute because neither were carrying any weapons. Trespass in Texas can get you shot but it’s only a misdemeanor. April 21, Chance was arrested at Camp Toyahvale and taken to the Reeves County jail. In total, Chance has 4 charges of operating an unmanned aircraft over critical infrastructure (or something like that). All the charges were filed by Apache and all but one–the warning given at the Weismiess lease–were on dates and times that Chance says he can prove he was not in the area. Apache is working overtime to make sure no one can see their dirty doings. Chance was still in jail when I left for Fort Davis were I’m staying tonight. The amazing thing that happened from all of this: Per the Reeves County Sheriff Granado, Reeves County Deputies will no longer be allowed to contract with the oil and gas industry as their security guards. It’s a conflict of interest. At least some integrity is still alive in small town Texas. It’s midnight. I’m tired. I also filmed some amazing pollution events today. I can’t wait to show you the one at an Apache facility that looks like Armegeddon. P.S. I got a text at about 1:00 am from Chance. He is out of jail and at the camp. The second one led to questions about Apache’s maintenance of their major gas pipeline and facilities there. Sounds like they need to fix their stuff better, and, lean on protestors less. Yes, they talk a good talk but their actions do not match what they say. Did you find out from Sheriff Granado directly that deputies are no longer permitted to be employed as private security? Is this a stipulation he laid down himself or is it coming from somewhere else? This conflict has also been a concern in neighboring counties, as you know. I did not but Darrel Rhyne met with the Sheriff and he told them directly. Well heck, Sharon, you live a very exciting life. I don’t need to know how to raise a teepee, but I would like to sample a solar-ovened S’mores. The next time I’m home, we’ll have some.